This study from Israel by Danziger, Levam and Avnaim-Pesso has done the rounds since first being published early last year. The researchers watched the cases of 1125 Israeli parole applicants over 50 sitting days as their cases were dealt with by one of 8 judges. This amounted to 40% of all applications for parole made in Israel over that period, and the study was randomised to remove the influence of factors such as cultural prejudice or administrative procedure. 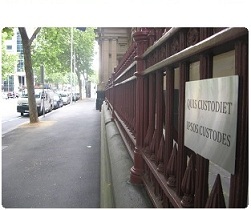 The parole hearings were conducted during one of three court sessions per day: the opening of court to morning tea; after morning tea to lunch; after lunch to the close of court. 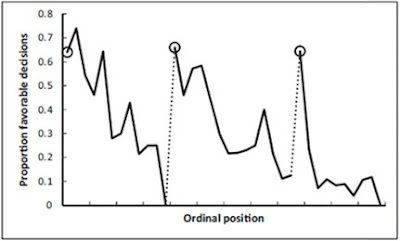 The results of the study (if watching this ABC webcast, the relevant portion of Dr Karl's interview starts around the 3:30 mark) showed that across all hearings and judges, applicants began each session with a 65% chance of having their application for release granted, and the likelihood of parole fell as the court session continued, only to return to previous levels after the next break. This was regardless of the characteristics that might ordinarily be thought to guide the decision-making process, like the seriousness of the crime, length of sentence, or the applicant's personal characteristics. A reproduction of Figure 1 from 'Extraneous factors in judicial decisions' by Danziger, Levam and Avnaim-Pesso. The researchers didn't draw firm conclusions about why applications were more likely to be granted by a judge who has recently returned to the bench. They suggested rest, the consumption of food, or improvement in mood as possible explanations. Significantly, when the trends were revealed to judges, lawyers and others who routinely sat in the hearings, they said they were unaware of the predictable pattern of decision-making. It's easy to assume that the judges were open-minded at the commencement of proceedings, and got more snarky and impatient as things wore on. But it's unlikely that misanthropy was the key motivator. A more probable explanation was that the decision to grant parole requires more consideration than the decision to refuse it. As the sessions wore on, judges chose the simpler and more direct choice available to them. It may not be news to say that a person's attention is at its sharpest when fresh and drops off as time goes on, but there's not much research done on how this phenomenon influences judicial decisions. Trying to measure the quality of judicial activity has always been fraught. While the number of appeals generated by a court may be one indicator, that is as likely to be dictated by external factors as it is anything the judge has control over. Although our focus has been on expert legal decisions, we suspect the presence of other forms of decision simplification strategies for experts in other important sequential decisions or judgments, such as legislative decisions, medical decisions, financial decisions, and university admissions decisions. Our findings add to the literature that documents how experts are not immune to the influence of extraneous irrelevant information. Indeed, the caricature that justice is what the judge ate for breakfast might be an appropriate caricature for human decisionmaking in general.